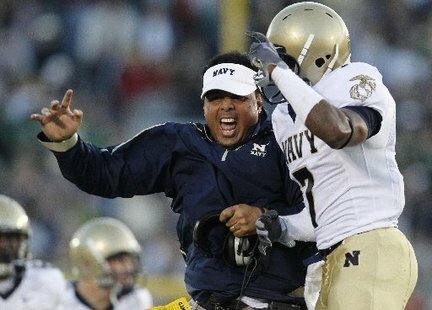 Navy coach Ken Niumatalolo is fired up about getting his spring game on national television, typically an honor left only for the big boys of college fooball. Tired of listening to NFL billionaires and millionaires bicker? Or flat out over all all this Cinderella talk with Virginia Commonwealth and Butler making the Final Four? Then mark your calendar for some sweet Navy spring football action. The CBS Sports Network will broadcast Navy’s annual Blue-Gold Spring game at 7 p.m. on Friday April 22. Check your local cable provider for the channel. Hint: It’s the one showing loops of all the March Madness games right now.